Mobile apps have replaced many electronic devices in the last few years and Voice recorder is one of them. There are many iPhone apps that can record voices around you quite decently. Therefore, if you want to record conversations or voices around you with your iPhone you must have best voice recorder app of iPhone. There are lots of the best voice recorder apps for iPhone on the app store but to find handpicked best out of them Read On! 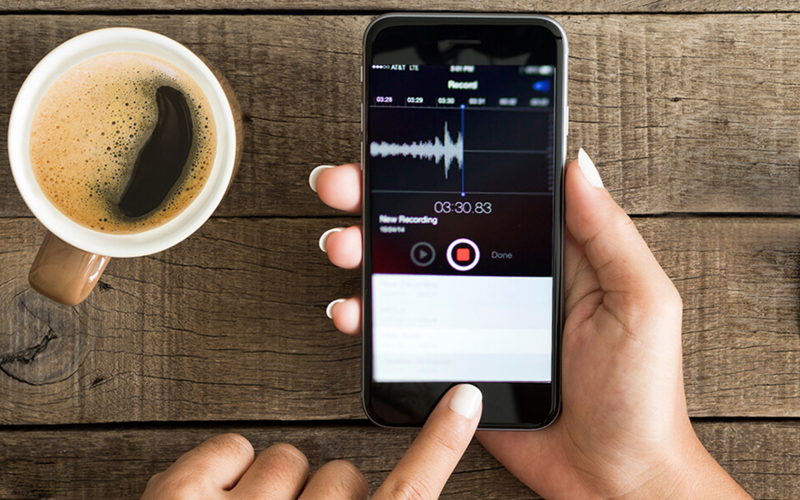 Here are 7 best iPhone apps that you can use to record voices in the best quality possible. It is one of the best voice recording apps for iPhone and iPad you can find in the App Store. The app has features that are designed for school/college students, lecturers, journalists, businessmen and even audio professionals and sound engineers. Now we don’t say that the app can replace a recording studio, but it’s pretty efficient in recording and rendering high quality sounds. The app offers bluetooth recording, background recording, unlimited time recording and iCloud sync. You can share your audio files via Airdrop, upload to SoundCloud or DropBox and has got many such features. To download the software or for more information, click here. MultiTrack DAW is another great voice recorder app for iOs that helps record multiple takes, experiments, solos and harmonies. MultiTrack DAW is more of a digital audio workstation than a sheer voice recording app. Other than recording, you can trim and mix audios to perfection and share them via email, WiFi and iTunes File sharing or upload to SoundCloud. The software has amazing overdubbing capabilities and can input voice from mics and USB interfaces, headset mics, and built-in-mics. It supports audio formats like m4a, mp3, wav, aac and aiff. MultiTrack DAW supports 32 bit and 64 bit audio processing, zoom support, multi-pinch support, backup and restore for tracks and so on. Click here to download MultiTrack DAW. HT Professional Recorder is one of the best voice recording apps for iPhone that can be used by both students and business professionals. Its user-friendly interface easily helps record and edit lectures, conferences, business meetings on you iPhone. It can also operate in the background hence you can take notes while the app is recording your important lectures. You can record conversation from a distance and automatically skip silence. It can even record whispers. You can record and send audio files (as WAV attachment and up to 30-minute length) via email. You can navigate easily to bookmarks for quick review. In a nutshell, though HT Professional Recorder costs $9.99, it is a great recording tool. Click here to buy the software. iTalk Recorder Premium is the best voice recording app for iPhone, if you like an intuitive and streamlined user interface. The feature-rich application provides recording quality- 11.025kHz, 22.05kHz, or 44.10 kHz. You can manage recordings with a fingertip. You can easily mail audio files from iTalk Recorder Premium. The tool also supports direct file sharing, AirDrop, SoundCloud and Share Sheet. iTalk Recorder always creates quality audio tracks irrespective of the challenges. Note: – When using the app for the first time, allow iTalk Recorder to access your iPhone’s microphone. In case, if the app is producing blank recordings, check if microphone permission is granted. You can check it by going to Settings > Privacy > Microphone. Enable iTalk if not enabled. iTalk Recorder Premium costs $1.99. Click here to download iTalk Recorder Premium. Note: – You can try iTalk Recorder for free. Click here to download iTalk free version. Recorder Plus is a freeware that can be used to record professional quality audio and playback sounds. This high-quality feature recorder app converts your iOS device into a recording tool. The software includes features like one-touch recording, background recording, and possesses a simple yet quick user interface. The app is insanely fast and you can even record for long hours. It supports audio formats like M4A, WAV, CAF, AND MP3. You generate three different qualities- High, Medium and Low. Recorder Plus supports iCloud drives like box.net, Google Drive, Webdav, OneDrive, and DropBox. Now store your favorite audio tracks to your Mac and iOS devices through Recorder Plus app for iPhone. Click here to download the app. It is one of the best voice recording apps for iPhone and ipad. This professional recording app helps you to record voice memos with configurable quality. Voice Record Pro supports standard formats M4A, MP4 AND AAC. You can trim, duplicate and append records with Voice Record Pro. You can even protect your tracks with passcodes with Voice Record Pro. Click here to download Voice Record Pro for free. Voice Recorder & Audio Editor by TapMedia is 100% free for your iPad and iPhone. It supports unlimited recordings, transcribed recordings (speech-to-text technology) and adding notes to every single recording. You can upload recordings to Box, OneDrive, Google Drive, DropBox, and of course iCloud via Voice Recorder & Audio Editor. The software supports sharing via Email, SnapChat, Instagram, YouTube, Twitter, Facebook and even messages. You can also transfer your downloaded recorded files to PC via a USB cable or WiFi. Voice Recorder & Audio Editor consists of some advanced features like passcode protection for recordings, loop recordings, changing playback speed, supporting multiple audio formats and many more. Click here to download Voice Recorder & Audio Editor. Hence ends the list of Best Voice Recorder Apps For iPhone . Did you like the article? Also, tell us if we missed any software in the comments section. We will certainly enlist them.